Places are filling up fast in our Easter Camp. The camp runs from April 7th to April 10th and costs just â¬45. The enrolment form can be downloaded from our web site or a copy can be requested by mailing camps@foxcabgaa.ie. Following on from their great win over St. Brigidâs last weekend, the U11âs made it 2 wins out of 2 when they turned in another magnificent performance against Clontarf on Saturday. Click here for a detailed match report. The U12âs 2 team continued their winning ways also with a great win against Clanna Gael. The 1 team game against Templeogue was postponed due to rain. The U13âs were unlucky to lose by 2 points to a very strong Castleknock team. The U14âs had a tough battle against Ballyboughal but they managed to hold on and win by 8 points. The U16âs had a huge win over St. Peters and this win sees them top of their group. Well done to the Dublin U14, Minor and Senior teams on their victories over the weekend. The FoxCab players played pivotal roles in all these victories. It was particularly pleasing to see 4 FoxCab players â Sinead Goldrick, Niamh Collins, Amy Connolly and Hannah Noonan - start for the Dublin Senior team against Tyrone and it was even more pleasant to see Hannah (1-01), Amy (0-03) and Sinead (0-01) on the score sheet. The Dublin senior team have a very tough game next weekend in the last round of the National League when they have an away game against Cork. They need to win to be in with a chance of making it to the National League semi-final. Best of luck! The senior team start the defence of their Division 1 Cup title on Wednesday (April 1st) with a tricky home game against Ballyboden. Throw in is at 6:30. The division 5 team start their cup campaign when they travel to play Thomas Davis also on Wednesday. The âGaelic 4 Mothers & Othersâ squad are holding a table quiz in The Grange Pub on Thursday April 16th at 8:30. A great nightâs entertainment is assured and your support would be appreciated. Close to 100 club members marched in the Bray St. Patrickâs Day Parade and thoroughly enjoyed themselves. Thereâs lots of photos on the club web site and Facebook page capturing the occasion. We also featured in the clip about the Bray parade that was shown on the RTE news. If you missed it, you can see it again by clicking here. Enrollment for the ever popular Easter camp is now open. The camp runs from April 7th to April 10th and costs just â¬45 for an action packed 4 days. Enrollment forms have been distributed to all local schools. The form can also be downloaded from our web site or a form can be sent to you by mailing camps@foxcabgaa.ie. The U11âs had a great start to their season when they had a fantastic win over St. Brigidâs. The U12âs continued their winning streak with a great wins over Clontarf and Round Towers Clondalkin and the U10âs turned in a huge performance against Cuala. Well done everybody! Following 2 great wins, our Minor division 1 team were unfortunate to lose by 2 points to Templeogue Synge Street. The U14 Division 1 and Division 5 teams lost narrowly to Kilmacud Crokes and Whitehall Colmcille respectively while the U13 team lost out to a very powerful Lucan Sarsfields team. The U9 game against Cuala was postponed. Club senior players Amy Ring and Olivia Crosson were part of the DIT team who made it to the final of Lynch Cup where they unfortunately lost to DCU by 2-13 to 1-10. Amy played a captains by scoring 7 points and finishing top scorer in the game. Congrats Amy and Olivia. The club are very proud of ye! Many thanks to Hunters Estate Agents who have sponsored a set of jerseys for the U13 team. The girls look magnificent in their new kit! Just a reminder that the academy continues each Saturday morning at 9:50 in Kilbogget Park. The club has a Twitter account - @OFFICIALFoxCabGAA. Please follow this to get the latest updates from the club. The club Facebook page also has information on the various activities in the club. Have a look at the Academy and the Gaelic 4 Mothers page too! The re-fixed U14 game against Ballyboden took place on Friday evening and the team turned in a magnificent performance to win by 4-11 to 3-5. The Minor A teams and U16 teams also had good victories over the weekend with the Minors overcoming Ballyboden and the U16âs beating St. Sylvesters. The Minor B team were unlucky to lose to a very good Man O Warm team and a last minute goal by Na Fianna saw the U13âs missing out on a victory. Well done to the club players who were involved with the Dublin senior and U14 teams who had great wins on Sunday. The Senior team beat Laois and the U14âs beat Longford. As called out in our notes on February 27th, the club will be marching in the St. Patrickâs Day parade in Bray. A mail with information has been sent to all mentors and we look forward to seeing as many players as possible marching on the day. After the parade all players, mentors AND members are invited back to Seapoint Rugby Club for a get together. Many thanks to Sherry FitzGerald who have sponsored jerseys for our U12 team. Just a reminder about membership and that this can now be paid on-line. To pay your membership, just visit the club web site and click on the link to access the on-line membership application system. The numbers attending the Academy continue to grow week by week so well done to all concerned. If you know of other players who might be interested in attending, please let them know that the Academy starts every Saturday morning at 9:50 a.m.
Well done to our Minor division 1 and U15 division 1 teams who started off their league campaigns with victories over Na Fianna and Erinâs Isle respectively. Well done also to our Minor division 5 team who continued on their winning ways with a superb win over Clontarf. The U14 division 5 team played St. Markâs and the U13 division 1 team played Kilmacud Crokes with both teams being narrowly beaten. Well done also to our U12 and U10 âGo Gamesâ teams who performed really well in their first games of the season. The U12âs played Croi Ri Naofa and Ballinteer St. Johnâs and the U10âs played Kilmacud Crokes. The U11 âGo Gamesâ against Kilmacud Crokes was cancelled and has been re-fixed for March 28th. The U14 division 1 game against Ballyboden was also postponed and no date has yet to be set for the re-fixture. Congrats to senior player Sinead Goldrick and her Dublin team mates who were invited to Ãras an UachtarÃ¡in as part of International Womenâs Day. 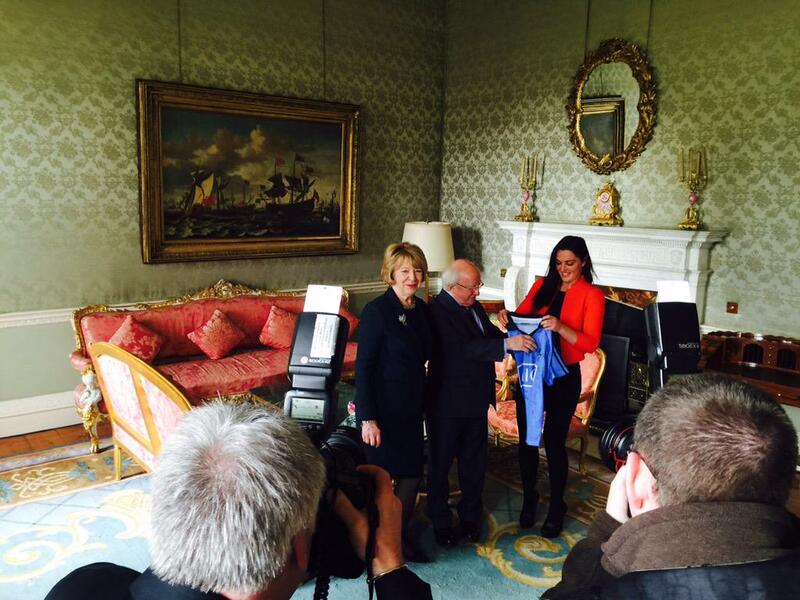 Sinead presented President Higgins with a Dublin Jersey. All teams have been allocated their training slots for the year. We would ask that if teams are organising extra training sessions or challenge games that they check with our Director of Football Gordon Bell first. To register, just visit the club website. The FÃ©ile panel held a very successful cake sale after 10 and 11:15 mass in Foxrock church on March 8th. The team and management would like to thank Foxrock Parish for their help with this. Congrats to the Dublin U16 team who beat Kildare in the Leinster Championship. Next weekend the U14âs are away to Longford in the Leinster Championship and the Senior team play Laois in the National Football League. Best of luck to all! Donât forget, the Academy continues every Saturday morning from 9:50!